February means that spring is just around the corner. Though your lawn may look dormant, now is the time to start preparing for the upcoming warm season. Pre-spring treatments like aeration and fertilization are key to maintaining beautiful, thick grass. And if you’re anxious for some color to appear in your garden soon, try planting these five flowers that you’ll be able to harvest in early spring. Sweet Peas. Sweet peas like the cold weather and cool soil, so it’s important to plant them now. 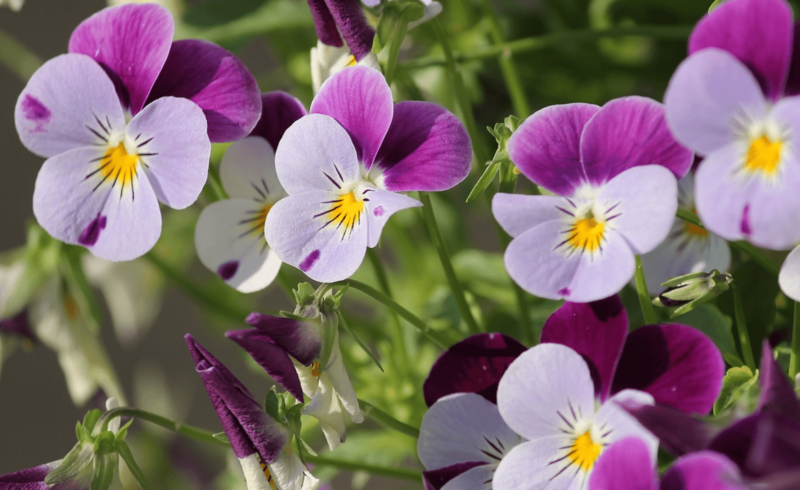 They are easy to grow from seed and come in shades of violet, pink, and white. While some varieties grow quite tall, others are more bush-like and thrive in container gardens. However you choose to plant them, you’re sure to enjoy their beautiful blooms come spring. As a bonus, ssweet peas smell lovely! Pansies. Pansies are happiest in temperatures lower than 65 degrees, so you still have some time to enjoy them before it warms up. They’re colorful and easy to grow. While you can plant them in the fall and enjoy them all winter, garden stores are still carrying them in varying sizes. When planted in a container garden or the ground, you should be able to enjoy their colorful blooms until springtime’s warmer air arrives. Violets. Violets are resilient and don’t require much upkeep. While their blooms are small, they bring a punch of color to your gardens and do well in containers or in the ground. They do best in light shade and moist soil. Plant them now and enjoy them until late spring. Winter Daphne. Winter daphne is a shrub that produces pretty pink or white blooms. The real treat from this plant, though, is its wonderful fragrance. Winter daphne prefers cold weather and should bloom throughout the winter and early spring. It likes light shade and mild temperatures. Winter Honeysuckle. Winter honeysuckle also offers a lovely fragrance, and its pretty branches covered in small white blooms can be clipped and used in a springtime centerpiece for your table. It works well as a hedge, and you can also find vining species. As a bonus, birds love it, too. While we’re sure to have a few more weeks of winter weather, you can start to enjoy the colors that spring brings to your garden with these cool-weather flowering plants. By planting early, your southern lawn will be prepped to deliver beautiful colors and wonderful fragrances for the months ahead.